UPDATE 7/8/13 – The body, believed to belong to Michael Kingsbury has been found. Although authorities state they do not have a positive ID, they believe that the body they found in a car on the 1700 block of West Virginia Avenue NE is Michael’s. 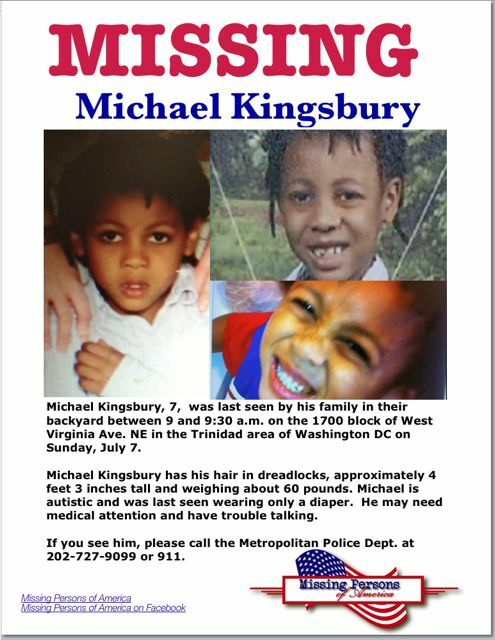 Previous story: A authorities are searching for a 7-year-old autistic boy from Washington D.C.
Michael Kingsbury was last seen by his family around 9:30 a.m. on the 1700 block of West Virginia Ave., NE on Sunday. The police are continuing their search for him through the night, but so far have not found him. They plan to search near Gallaudet University and Trinidad on Monday. Cmdr. Andrew Solberg, is hoping that everyone will keep a look out for Michael. Michael if 4’3″ tall, 60 pounds with dreadlocks. He may need medical attention and may have trouble talking. poor guy probably climbed in because he was tired (I hope) and the heat got to him.